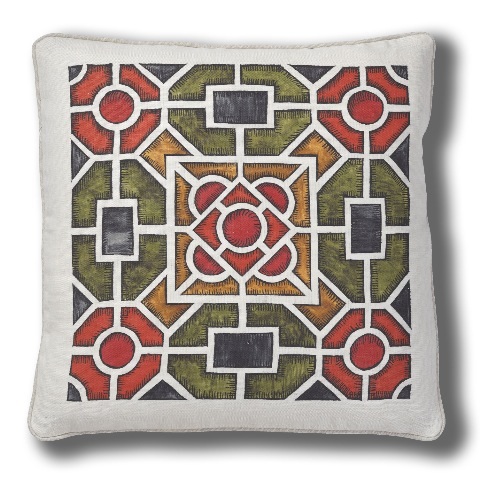 (3BL Media / theCSRfeed) Februrary 29, 2012 - Consider the humble pillow…..
Now consider it again after taking a gander at our Greenspiration Home American Made Pick-of-the-Week, this lovely "Maison Rustique" pillow designed and created by the Dallas A. Saunders Studio. What you have here is an inspired design that incorporates historical record, natural Belgian linen, and US craftsmanshp. It’s not just a place to rest your head, it’s a work of art. The entire Maison Rustique line of sophisticated pillows helps create jobs in five states across the country, as well as providing funding for the preservation and restoration of public and private cultural and educational institutions including: Hearst Castle, a California State Historic Monument/California State Park and The Huntington Library, Art Collections and Botanical Gardens. Owner/artist Dallas Saunders created the Maison Rustique design by manipulating digital images of original wood block prints by the French artist Charles Estienne, first published in 1572. Clearly, the pillow is more than just a conversation piece; it’s an artistic study in and of itself. “There is a difference between commodity products from mass merchants and artisan designed and made objects that are a thrill to purchase in person because you just love them and have to take them home,” said Saunders. Regretfully, Saunders has not been able to find the quality woven linens and silks in the US, so those materials still come from Ireland and Belgium, where she works with sustainably focused mills. However, the fills are made in Ohio, the welt cord is made in North Carolina, the zippers are made in New York, and the pillow is sewn in California. The down stuffing for the fills is imported. “We need to eat more duck in the US to supply the down and feathers!” Saunders jokes. Saunders attended her first New York Gift Show in January and as a result will soon be selling through various retail shops. For now, her work can be found at www.modenus.com and www.dallasasaunders.com.